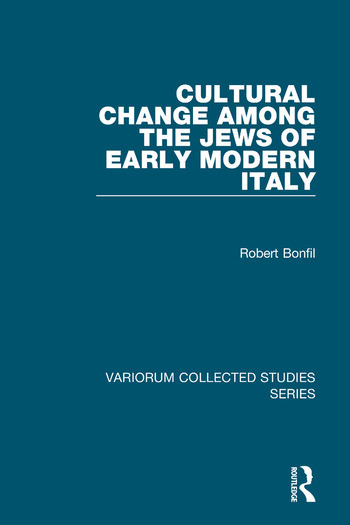 The articles collected in this volume display Robert Bonfil's pioneering reappraisal of the economic and socio-cultural history of the Jews of Italy during the Renaissance and the early modern period, focusing on their encounter with and incorporation into the Italian society that surrounded them. Rather than thinking in terms of challenge and response, and the passive surrender of the Jews to the influence of their Christian surroundings, Bonfil's exploration of the evidence shows it mirroring their conscious choice to preserve a distinctive Jewish identity while at the same time being an integral part of the socio-economic and cultural fabric of the environment in which they lived. Rejecting the ideological assumptions of both the lachrymose and anti-lachrymose conceptions of Jewish history, these are articles which provide stimulating explorations of the realities of the era, and paradigms and case studies of the processes of cultural adjustment to the impact of constantly changing otherness. Contents: Preface; The historian's perception of the Jews in the Italian Renaissance: towards a reappraisal; Some reflections on the place of Azariah de Rossi's Meor Enayim in the cultural milieu of Italian Renaissance Jewry; Halakhah, Kabbalah and society: some insights into Rabbi Menahem Azariah da Fano's inner world; Cultura e mistica a Venezia nel cinquecento; How golden was the age of the Renaissance in Jewish historiography? ; Change in the cultural patterns of a Jewish society in crisis: Italian Jewry at the close of the 16th century; Preaching as mediation between elite and popular cultures: the case of Judah del Bene; Changing mentalities of Italian Jews between the periods of the Renaissance and the Baroque; Italy - the sad epilogue to the expulsion of the Jews from Spain; Gli ebrei d'Italia e la riforma: una questione da riconsiderare; Jewish attitudes toward history and historical writing in pre-modern times; A cultural profile (of the Jews in early modern Venice); Il problema dei conversos nel XV secolo e le sue ripercussioni per la ristrutturazione dell'atteggiamento ebraico nei confronti del cristianesimo all'alba dell'epoca moderna; Index.